To accommodate these alternatives in the Fit_Circ3D function I have added an optional “method” argument to the function. Method 0 calls the original routine. Methods 1-4 call the SciPy methods listed above (default method = 3 if the argument is omitted). I have not been able to get method 5 to work properly from my code, so at the moment this option is not available. All are included in the default Anaconda Python installation. 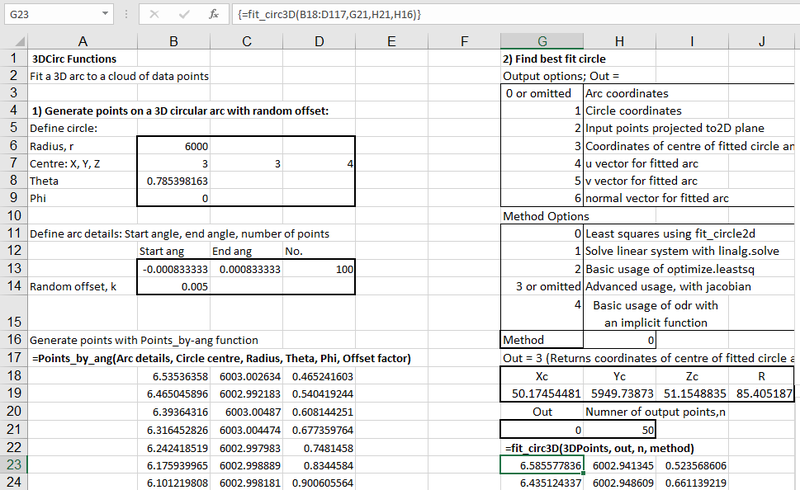 This entry was posted in Coordinate Geometry, Curve fitting, Excel, Link to Python, Maths, Newton, NumPy and SciPy, UDFs, VBA, xlwings and tagged curve fitting, Excel, least squares, Numpy, ODR, Python, SciPy, VBA. Bookmark the permalink.